This is the first time I blog about Monday at work. But before that, let me show you some of G's picture, before he had his haircut. I have always wanted to cut his hair but I don't know how. So it's best to bring him to the barber to cut his hair. RM5 only per cut, so why not? 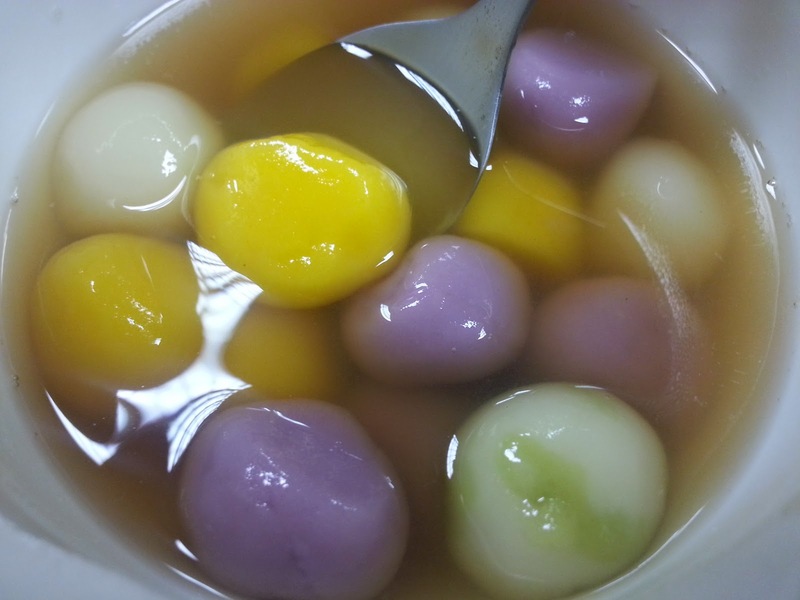 Anyway, it was Dong Zhi yesterday, so we had some fun in the office by making "tang yuan" together, and boil them in ginger+pandan leave+sugar syrup. I know, one day late, but my blog, my sukak, my like! Happy Dong Zhi everyone ! I don't read Mandarin, but I've asked my colleague to translate it for me.. Oh so you think G looks better after the hair cut? 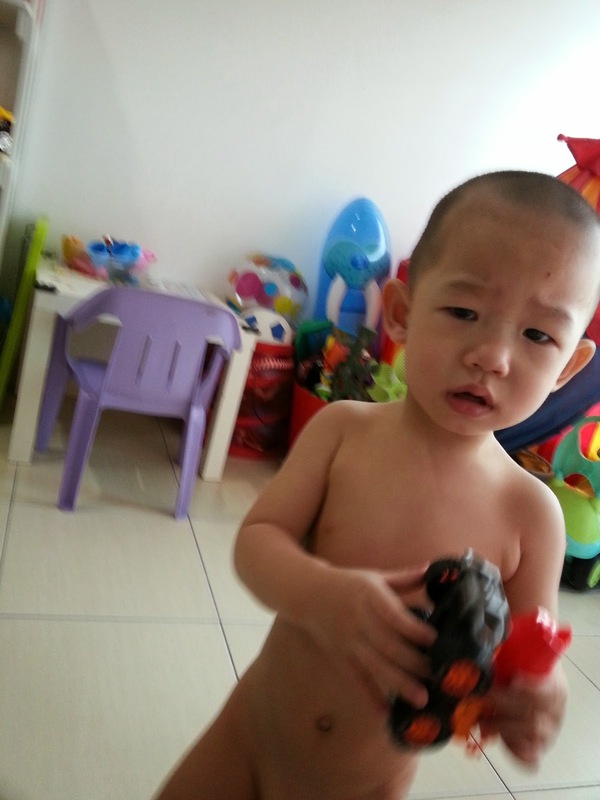 Teehee..
Kz also cut hair, but not much, and not botak. G pulak botak lor, coz no "sitt dai" ma.. You know ahh, if cut hair and don't cut botak, very "sitt dai" la, especially when the sides grow liao ahh, then have to trim again, sien lor.. Err, yes, my mum also said G looks better with hair, now he looks more like samseng, hehe..
Make tong yuin in the office? Your boss so good ah let you all do that?? Here is like aunty pantry la.. The old ladies, oops, sorry I sound rude, but they make tang-yuan every year leh in the pantry.. Some even bring raw food to cook in the pantry timm.. But I don't do that la.. Inside no fillings one.. Here ahh, those ladies very health conscious one.. The yellow one is made from pumpkin, the purple one from sweet potato, and the green one from fresh pandan juice.. No artificial colouring one leh, don't play-play.. I didn't eat any. Nobody in the house likes...and neither do I. Hard to chew and swallow, feel like choking! Heheh.... botak good. Hair less smelly especially when the kids played with all the sweat and so on. Nice tong yun. I didn't eat any ,back to sg to work. Oh yes, I love babies with bald head, haha, love to smell their "baby smell", and can smell easily too if no hair.. Happy Dongzhi to you and your family! Oh... before I forget, Merry Christmas and Happy 2015 too!!! Louiz, alamak why you botak him? I think he looks cute with hair. Of course without hair also cute lah but with hair lagi cute :) You all actually make tang yuan in the office pantry? Amazing! 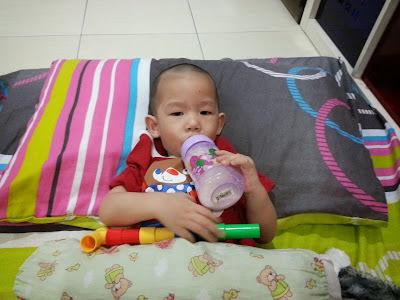 Hubby wanted to botak him so that it takes longer time for his hair to grow, thus, save us the time to go take him cut his hair again, teehee.. I can smell his "baby smell" easily now.. Errr, yes, those ladies (not me) cook inside the pantry, not me, but that day, I just helped to roll the tang-yuan only, hehe..
Wow! Fun in the office pantry? Great. 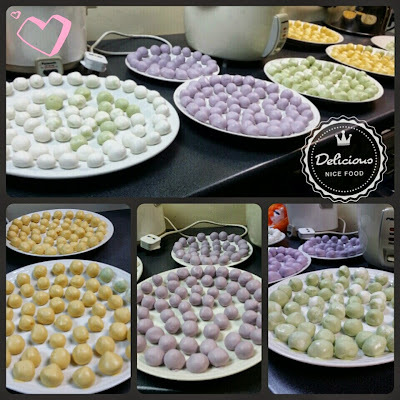 Very colourful tang yuan. Yeah, once a year we make tang yuan together in the pantry.. But they cook most of the time during lunch..
haha, why u botak and bogel him? aiya he malu la! He naughty naughty lor, runninh around naked tak mau mandi.. I din't have any tang yuan this year :( But yours look good! 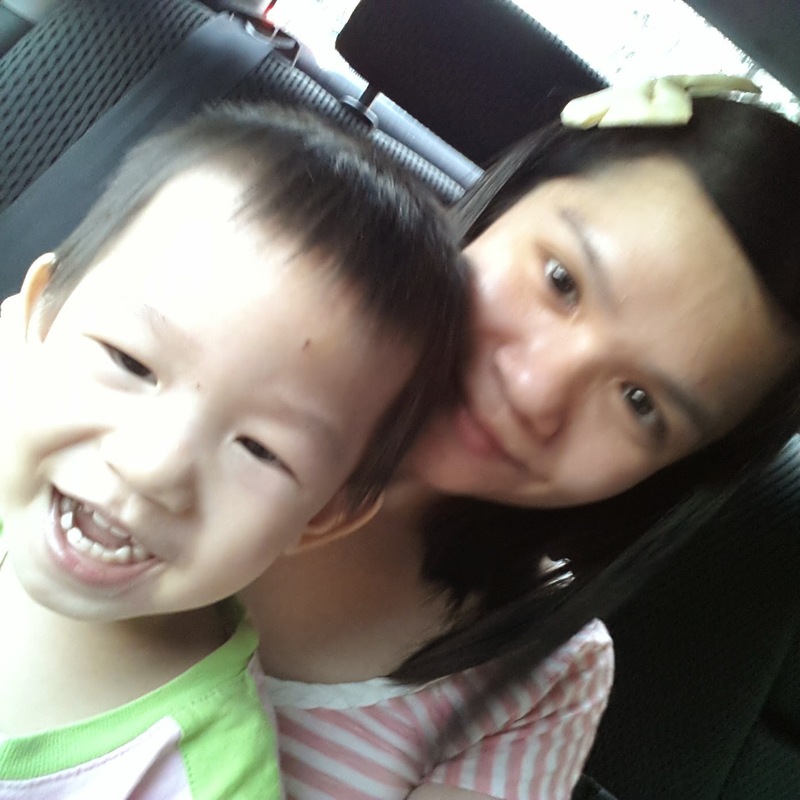 I like toddlers with bald hair, can smell their 'baby smell' easily, hehe.. Merry Christmas too! Nice to make tung yuen together. I like to eat tung yuen..my favorite. I like those with filling inside.. They say filling up with peanut butter is nice..
Short hair very 'ying' one, but I dont want to cut short hair, then where should I place my ribbon? hehe..
Merry Christmas Princess. Your sukak and your like quotes always tickled my ribs. Your boys looked cuter with hair! OMG! Are you trying to save shampoo to keep them botak? 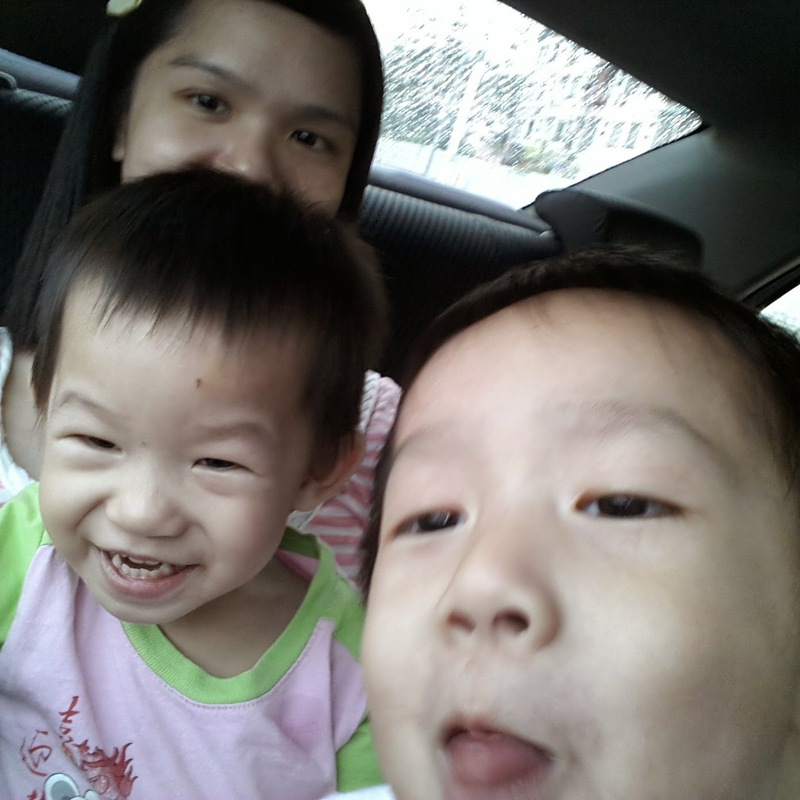 Muahahahaha I think botak kids look like babies again. Half right. Not trying to save shampoo, but trying to save the time to take them for a hair cut again, haha.. YES! Botak babies are cute, can smell their 'baby smell' easily leh on their forehead..
hahaha.. at least you blogged about this.. i didn't even snap a pic of it.. hahaha..
Once a year thingy, plus nothing much to write jor, so I just post about it lor.. Hehe..
My grandma would only make red (or white e.g. uncolored) coz that's the tradition for Heng Huas. We eat it dry too (without soup) and sprinkled with brown sugar and crushed peanuts. Princess Ribbon, you really wear Ribbon on your hair all the time, hahaha! Wahhh...make so many tong yuen geh! I didnt do any this year.. my sister bought from Jaya Jusco, those with fillings inside... very nice also! hahaha..
Actually I like those with fillings.. Nicer leh..